Have you heard of a coffee shop that requires/accept reservation during weekend dinner time? 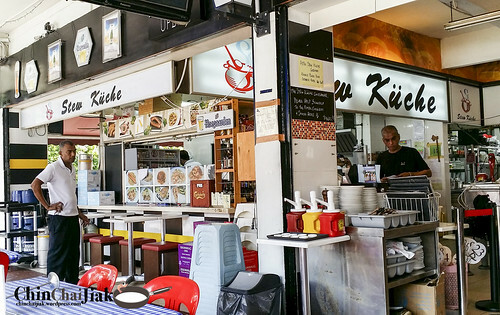 Salute, one of the most hip coffee shops in Singapore, is filled with stalls selling “Ang Moh” style cuisine like speciality coffee, French cuisine and i am going to write about Stew Kuche, a stall that specialises in affordable German Cuisine. 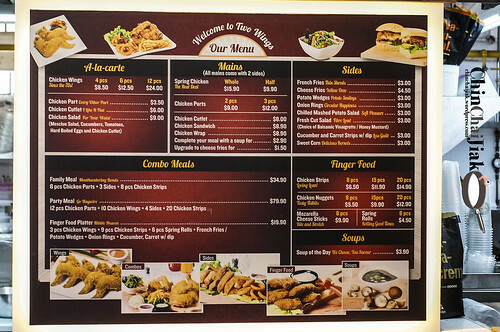 One of popular stalls, two wings, is also located in this coffee shop. 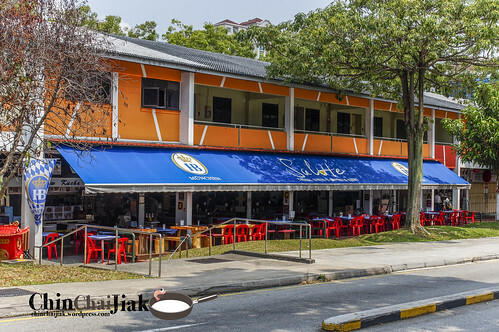 A friend (who wanted to be named), Charlie, recommended this place to me and swear that this is the most value for money Pork Knuckle that you can find in Singapore. He actually wanted me to link his name to his facebook. Charlie, if you are reading this, i am not going to do that. Stew Kuche, means Stew Kitchen in German. 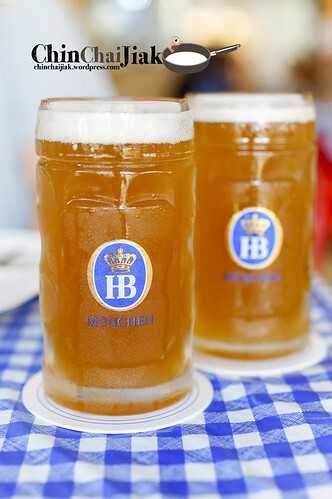 and it is most well known for their Schweinshaxe (pork knuckle). Not only it taste great, portion is big, the price is also rather economical. 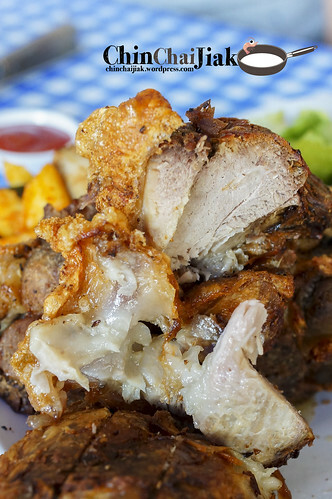 When we mention pork knuckle, which part of the pig is the knuckle? When people mention pork knuckle, they are actually referring to the hock of a pig. 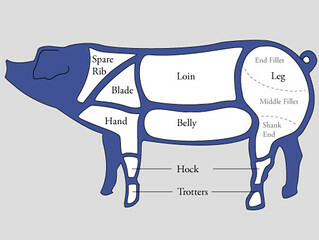 It is around the lower knee area of the pig that extends towards the ankle. We ordered their pork knuckle platter which consist of a whole pork knuckle, potato wedges, achar, garden salad, mash potato and two German sausages. 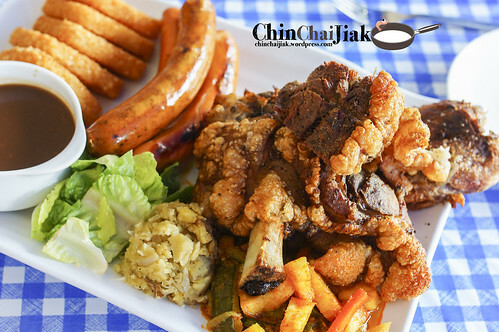 Typically, German Pork Knuckle comes with a side of Sauerkraut (fermented cabbage) but theirs come with a local twist – our Singapore’s achar. Stew Kuche ran out of garden salad and potato wedges so they gave us one more sausage(!) and five hash browns, which is awesome. I think the sausages are decent. Not exceptional, but very decent. The portion is quite big and i enjoyed it. 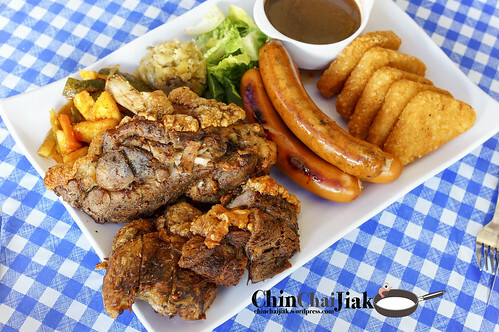 Their pork knuckle is the definitely the highlight and the whole platter only cost $35 nett. In a typical restauant, a banger and mash already cost you about $12. This platter is good to be shared by two to four pax depending on how hungry you are. The skin is crackling crispy and probably everyone will be fighting for it to the last bit. The pork knuckle is well roasted and some parts of the exterior are a little drier. This can be rectified by dipping it into the bowl of brown sauce. 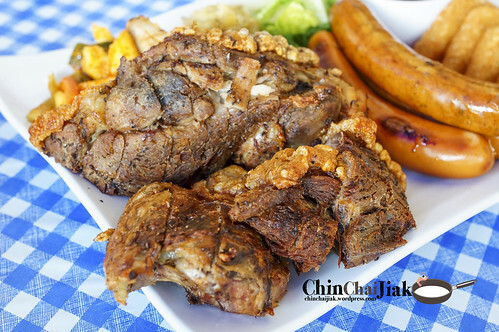 At just $25 for a whole pork knuckle, i will choose this over Brotz**t’s easily. And what’s better than pork knuckle? Pork knuckle with German beer! I have read about how much some bloggers raved about Two Wings online and I finally had a chance to try it. At $2+ per wing, it’s definitely not cheap to begin with. I feel that the marinade is a little similar to our Nasi Lemak’s wing so it’s no wonder that some people that think that Two Wings is actually not a big deal. 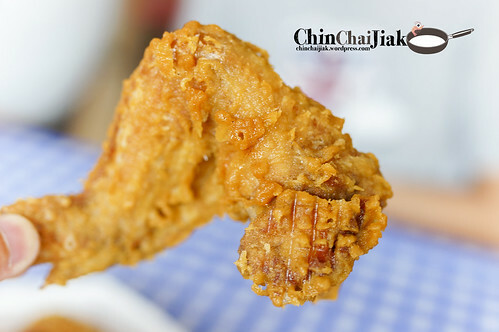 The juicy wing is freshly fried and is evidently meatier and bigger in size comparing to a typical nasi lemak wing. I find Two Wings is rather good, just that there is no need to make a special trip down just for them. Given the current cafe hopping culture, chilling out and hanging out at a coffee shop is considered as “not hip” and probably something that an elderly person would do. However, Salute smashed this perception totally. Stew Kuche, apparently the main attraction in the coffee shop, offers the most reasonably priced German food and yet does not compromise on the taste. Pairing their pork knuckle with a few glasses of ice cold German beer and a couple of fried chicken wings is definitely one of the best ways to end a stressful day of work. Prost! – ein Toast!